Rapid sea invasion along the Gujarat coast is forcing families of fishermen to abandon the sea and their homes. 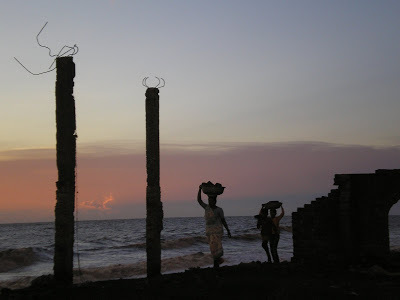 Villagers with bricks retrieved from their old homes in Danti. DANTI in Valsad district of Gujarat is being invaded. More than half the residents of this sleepy fishing village have fled already. It is not guns and troops that they are running away from. The sea they revere has swallowed up the village and is making them beat a retreat every year. 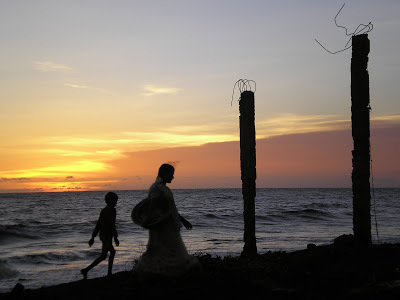 Only the poorest remain on the edge of the village, with just a sea wall for protection. On one side of the wall are lashing waves. On the other are ramshackle, makeshift huts. No one here has permanent brick homes. They have to rebuild every year after the waters rush in over the wall. The sea knows no boundaries. Govindbhai Tandel is the first to face its fury. His hut lies at the tip of the village, very close to the seafront, unprotected even by a stone wall. Govindbhai is back home after spending eight months away at sea on his fishing boat. He returns to Danti during the monsoon, when it is too rough to be out fishing. But there is no rest at home. His family is hard at work filling their porch with sand, trying to elevate the entrance to prevent the tide from coming in. There is not much they can do. Water will flood their home anyway. It is only an effort at damage control. “We have moved back three kilometres in the last 20 years. Our original village was out there. You can’t even see it now,” says Govindbhai. “Three village wells have been submerged. We’ve relocated the school thrice. I’ve shifted home thrice so far. Can you see out there? That’s where my last house was,” he says pointing to a distant spot in the sea. The village is long gone, but lives in memory. As we walked around the village, most people pointed to various landmarks – all in the water. Nostalgia is the only thing that remains. During low tide, the beach is a hive of activity. Families are hard at work, trying to salvage bricks from the ruins of their old homes. A road built two years ago near Kaladra village has been eroded. A sea wall (in the foreground) offered little protection. There is often a lot of water in their homes, but not a drop to drink. “Our wells are in the sea. We get drinking water from the tap once every week or in 15 days. Otherwise, we have to buy water. Tempos come and supply water. It is Rs.30 a barrel, which lasts a day,” says Damentiben. 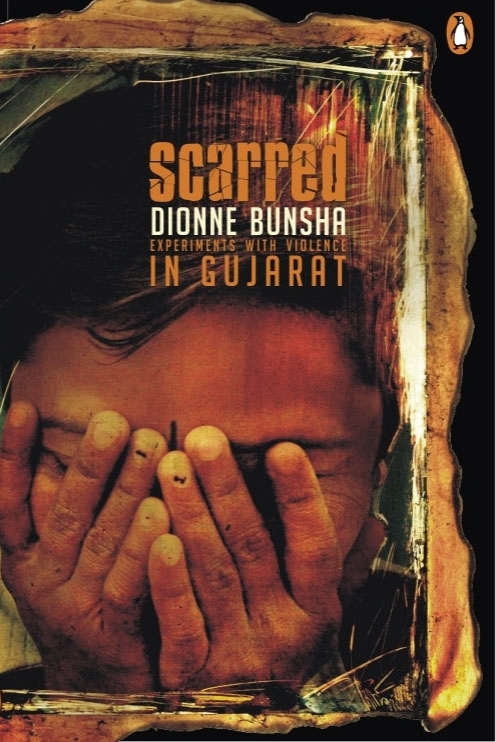 Danti is on the coast of south Gujarat, one of the most industrialised areas in the country. It is called the `Golden Corridor’, but has some of the country’s worst polluted spots such as Ankleshwar and Vapi. Dandi, the site of Mahatma Gandhi’s historic Salt March, is 12 km from Danti. “The fish have gone further into the sea because of [industrial] pollution. And the water has come further in; so we have suffered. We can’t go very far in our tiny boats. We used to get 400 to 600 fish in one night. Now we barely get a hundred,” says Shantibhai Tandel, a small fisherman. He has shifted back six times and is now in his seventh house. “I want my kids to study. The only thing is we can’t afford donations for their education or bribes to get them a job. If they are lucky, they will find a job, otherwise they will have to stay here, continue fishing and face the hardships.” Sandwiched as they are between the sea and the saltpans, there is not much further they can retreat. The villagers along the coast are not sure why the sea is advancing at such a voracious pace. Some fishermen guessed it might be “because there are more storms in the sea”. One of the reasons could be a rise in sea level owing to global warming. They don’t know what global warming means, but have become “environmental refugees”. Although they are barely surviving, the fisherfolk are facing the brunt of reckless consumption in more affluent places. Ironically, most of these villages have not been provided electric metres. People tap electricity from the power cables that run above their homes. 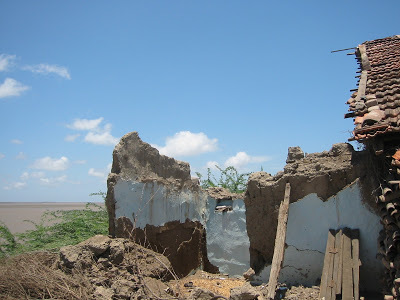 A house ravaged by the sea at New Kaladra in Bharuch district. Geologists from M.S. University, Vadodara, are studying the Gujarat coastline as part of an all-India study by the Space Application Centre of the Indian Space Research Organisation (ISRO). “Our preliminary observations reveal that the seawater has shifted in by 10-15 metres in 10 years, and at places it has moved around 80 metres horizontally,” says Dr. Nikhil Desai, who is heading the survey of the Gujarat coast. They are comparing recent satellite images with Survey of India maps prepared in the 1960s, and have observed that the contours of Gujarat’s coast are changing. 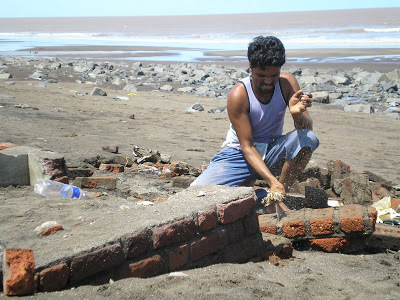 Several places along India’s 7,500 km-long coastline are experiencing similar erosion. In the Sunderbans, two islands have already vanished from the map, displacing 7,000 people. Twelve more islands are likely to go under owing to an annual 3.14 mm sea level rise, which will make 70,000 people refugees. Five villages in Orissa’s Bhitarkanika National Park, famous for the mass nesting of Olive Ridley turtles, have been submerged, and 18 others are likely to go under. India is one of 27 countries identified by the United Nations as the most vulnerable to the impact of global warming-related sea level rise. “Observations suggest that the sea level has risen at a rate of 2.5 mm a year along the Indian coastline since the 1950s. A mean sea level rise of between 15 cm and 38 cm is projected by the middle of the century along India’s coast. Added to this, a 15 per cent projected increase in intensity of tropical cyclones would significantly enhance the vulnerability of populations in cyclone-prone coastal regions,” according to Dr. Murari Lal, a renowned climatologist engaged in research related to climate change vulnerability analysis in India. Lal has been one of the lead authors of the UN’s Intergovernmental Panel on Climate Change (IPCC) reports for over 15 years, which collates research about climate change from scientific work across the world. 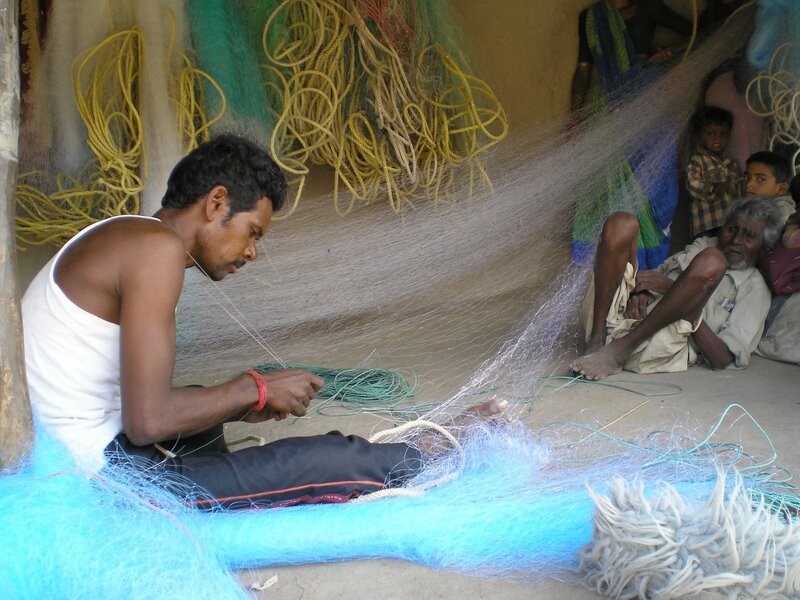 Jayantibhai Rathod repairs his fishing net at New Kaladra, where he resettled after the fishing colony at Kaladra was submerged 15 years ago. “Sea rise due to global warming could be just one of the reasons for the erosion along the Gujarat coast,” says Desai. “Local factors could also be responsible. Neo-tectonic activity – shifts in the level of the seabed – could also cause the sea level to rise. If there are disturbances in sediment budgeting along the coast, the amount of deposits from rivers, it could also affect the water level.” Their study will determine which of these reasons is driving the changes along the coast. 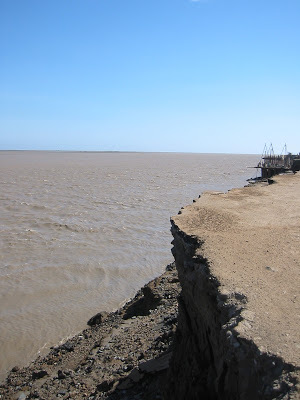 Further north, at the estuary of the river Narmada, Kaladra village in Bharuch district is also being nibbled away by the sea. Several houses are broken and hanging on the edge of a cliff of sand that threatens to cave in at any point. A sea wall built 20 years ago is now a relic of the past. A road constructed two years ago (at a cost of Rs.30 lakh) has been cut like a cake by the lashing waves. “The poorest are the most directly affected by this. Most families here are in a dilemma. They can’t afford to shift but they cannot stay here either,” said Desai. Children help in raising the level of Govindbhai Tandel’s house in Danti as the family braces itself for the onslaught of the monsoon. Kaladra too has been almost abandoned. The Rathod fishing colony here was washed away some 20 years ago. 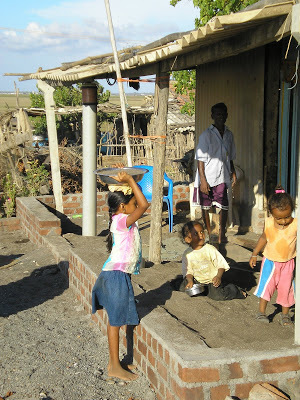 The fisherfolk resettled in “New Kaladra”, a little higher up the estuary, but their houses are still temporary. Here too, there is no escape from the advancing water. “For around six days every monsoon, the water is waist deep. Then, we bring our boats to the doorstep and fill all our stuff in it,” says Jayantibhai Rathod, a fisherman. When fishermen are forced to run away from the sea and they do not want their sons to continue their trade, it is time to start worrying. “This is a land of sand so you can never tell when it will shift,” says Shantibhai Tandel. A view of an eroded road in Kaladra. “We will keep moving back as far as we can. Then, it’s in the hands of destiny.” It is total surrender to the forces of nature. But how much of Nature’s fury has been because of the recklessness of other people? The residents of Danti and Kaladra are too busy surviving the onslaught of the sea to dwell on the actions of others. It is the last thing on their minds as they sit on their rooftops in the pouring rain. omething else During 1980 to 1990, the stateattained dogliedbuit growth rate in four years while itexperienced double digit growth rate in six years in subsequent decade. Gujarat experienced fasterpace of growth during 1980s when MadhavsinhSolanki and then Amarsinh Choudhary, both ofCongress, led the state government. In this period,the state had highest growth rate for its SDP. Thestate experienced the highest annual economic growth rate of 19.5 per cent during the six yearperiod of 1988-94. Since then this much of highrate is never attained. This period includes thereign of later years of Amarsinh Choudhary andinitial years of Chimanbhai Patel. As against this, thehighest rate of growth during the Narendra Modi era was only 14.77 per cent in 2003-04. Duringfive decades of its existence, the state of Gujarathad experienced 20 per cent or moregrowth rate only during six years. It had crossedmarvelous 40 per cent in 1988-89 and it was morethan 30 per cent in 1992-93 when Amarsinh Choudhary and Chimanbhai Patel ruled the staterespectively. However, there is not a single yearwhen the growth rate is more than twenty percent since 1993-94. In fact, it reached up to 19.33%in 1996-97. Barring it, the the SDP growth rate hasnever been more than 15 per cent during 1992-93 to 2008-09. In other words, the Narendra Modi erahas never reached the high growth rate of SDP thatwas achieved earlier. I came across your article and found it very interesting. I am from Valsad (spent my school years there) and Im studying climate change and development. I had no clue that Valsad was affected due to sea-level rise. Your article helped me enlighten about this topic.